1894 - Regulation and treatment of sewage and control of water supply started in Quebec. 1894 - The Provincial Boards of Health in Quebec (1894) and Ontario (1895) were required to approve all plans for waterworks and sewer projects. 1906 - The federal government established a Commission of Conservation, an advisory group with a broad mandate to conserve the nation's natural resources, and included measures for the improvement and maintenance of public health. The Commission included the federal ministers of agriculture, interior and mines, and the minister of national resources from each provincial government. 1911 - A major typhoid fever epidemic in Ottawa galvanized interest in improving sanitation treatment systems and water purification using chlorination, which sharply reduced typhoid incidence and incidence of other water-borne diseases. 1923 - The divisions of engineering, hospitals and sanitation, and control of pollution of inland waters were established within the federal Department of Health. 1945 - The first Canadian community water fluoridation trials began in Brantford, Ontario, leading to improved oral health; today, 70.3% of the province of Ontario has access to fluoridated water. 1968 - Guidelines for Canadian Drinking Water Quality were published by Health Canada. 1970 - The first Earth Day was recognized, a day for education, activism and the environment. 1988 - The Environmental Protection Act was passed to reduce the contribution of vehicles and engines to air pollution in Canada. 2000 - Contaminated water in Walkerton, Ontario, caused seven deaths and sickened thousands. In 2002 the Walkerton Commission released the report that laid much of the blame on the Walkerton Public Utilities Commission, where for years "operators engaged in a host of improper operating practices." 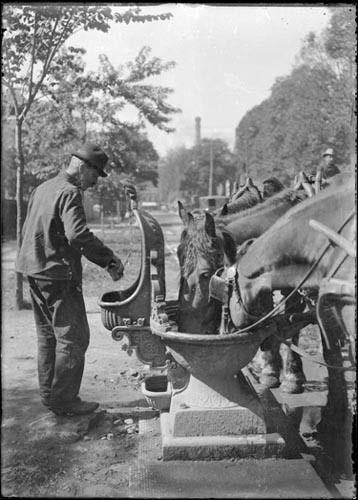 Horses taking drink: Archives of Ontario. Digital Image Number I0019323.JPG.